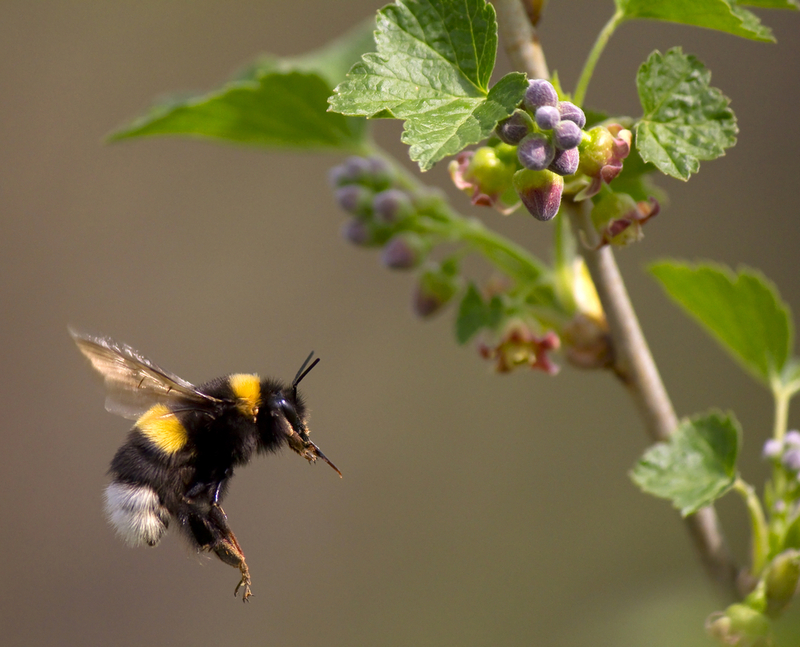 Myth: Bumblebee’s shouldn’t be able to fly. There’s an oft repeated “fact” that the humble bumblebee defies all known laws of physics every time it flaps its tiny little bee wings and ascends to the sky. Now obviously this is false, since, well, bumblebees fly all the time and if every time a bee took off it was tearing physics apart, we’d probably realize that was the case when two thirds of our population disappeared after being pulled into tiny, bee-shaped black holes. And, certainly if this was the case, every physicist dreaming of a Nobel Prize would be devoting all their time to breaking the code of bumblebee flight in order to disprove some bit of our understanding of physics. That being said, if you work out the math behind the flight of the bumblebee, you’ll find that it actually shouldn’t be able to fly… so long as you don’t take into account all the relevant factors, which seems to be how this myth got started. Basically, if you calculate it all assuming bumblebees fly like airplanes, then sure, the bumblebee shouldn’t be able to fly. But, of course, bumblebees don’t fly like airplanes. So where and when did this myth start? The often repeated story goes that many years ago an engineer and a biologist were having dinner and a few drinks, after the topic of conversation turned to each person’s respective field. The biologist asked the engineer to work out how a bee flew- scientists partied wicked hard back in those days. The engineer, keen to show off his skills, quickly jotted down a few calculations and came to the conclusion, that holy crap, a bee shouldn’t be able to fly. Today, the story is fully ingrained in pop culture and many sites and people without looking into the matter, repeat it as fact, even though one wonders how such a drunken mathematician had the pertinent numbers on hand to perform such calculations on the spot… Hell, the Dreamworks Animation film, Bee Movie, with a budget of $150 million apparently couldn’t spare a few bucks to consult a physicist on the matter, and opened with a variation of the “bee’s shouldn’t be able to fly” myth on a title card, and that’s a film aimed at children, in 2007! Man, we really should be investing more money in schools or at least more factually accurate bee based movies. As to the origin, it’s always possible, albeit somewhat unlikely, that a drunken scientist did indeed make a “back of an envelope (in some versions it’s a napkin) calculation” that proved bee’s shouldn’t be able to fly. An origin theory with a tad more documented evidence behind it, pins it on a French book published in 1934, Le vol des insectes, which makes passing reference to that fact that simple calculations yield a result that suggests insects, not just bumblebees, shouldn’t be able to fly. Some say it was German physicist Ludwig Prandtl who was responsible for popularising and spreading the myth amongst his peers, whereas others claim that the original calculations were made by one Jacob Ackeret, a Swiss gas dynamicist. In the aforementioned earliest known reference to such an idea, Le vol des insectes, Antoine Magnan, the author, claims the calculations, in regards to insects disobeying the laws of physics, were made by his friend and assistant, André Sainte-Laguë. Of course, the author should have been skeptical on the accuracy of his friend’s calculations and assumptions given that many insects can fly, but here we are. So while we can’t be sure he was truly the first, the first known calculations on the subject were made by Sainte-Laguë, though this fact doesn’t necessarily mean that another physicist didn’t do similar calculations during a drunken argument, which is good because we like that part of the story. What isn’t known is how the fact first eked into the public consciousness, and it’s likely we’ll never find out due to it being so long ago. The reality is that bees and comparable insects fly in an incredibly complex way that utilises, get this, mini hurricanes! We’ll link all this stuff at the bottom in the references if you’re interesting in the nitty gritty physics, but in lay terms, bees fly by rotating their wings, which creates pockets of low air pressure, which in turn create small eddies above the bee’s wing which lift it into the air and, thus, grant it the ability to fly. To find this out, scientists have conducted a variety of tests using bees, the most awesome one being by Chinese scientist, Lijang Zeng and his team, who devised system comprised of lasers and tiny mirrors glued to bees back in 2001. This experiment was deemed superior to previous tests, as it didn’t need to use tethered bees (which fly differently) and because it contained lasers, which is of course super cool. We’re fairly certain that a laboratory full of Asian scientists firing tiny laser beams at bees covered in shiny body armour is going to be the next big Syfy channel hit, so remember that you heard about it here first. In fact, the way bees and other comparable creatures fly is so efficient and causes so little drag, that research into the subject has been backed by various militaries in an attempt to mimic this method of flight with our own tiny insect-like robots, which is just a recipe for another Syfy hit. Pointing out of the nearest window won’t defeat this argument. Your article, however, will. Even more over, it was according to human laws of physics that bees couldn’t fly. This goes to show, who are we, as a species, to decide what is and isn’t possible. We’re such a high and mighty society that we actually believe that if we can’t explain everything about something it must be a higher power. Here’s an idea, maybe higher powers were created to explain what we couldn’t and provide some way of governing society. Either way you look at it you can tell that not everything needs to be explained in order to be possible. I’ll take a line from good old G.I. Joe and say knowing is half the battle, the other half is knowing we might just be wrong. Well, it was according to what they knew about aerodynamics at the time, and as the article points out, they were approaching the study from the perspective of fixed-wing aircraft. The laws of physics are the same for all living things. I agree not everything needs to be explained, but understanding how things work leads to applications that can enhance our lives. It is the entire basis of our current technological civilization. I think you misunderstand what people use this for. People aren’t arguing that the laws of nature are wrong so pointing out that bee’s do in fact fly wouldn’t defeat their argument. David is much closer. The idea is that scientists make claims all the time, but people who use this logic often use it because they want people to get that our understanding of reality is not accurate. As good as our science is, there are still lots of things we can’t explain and don’t understand completely if at all. People who use this bee fact are usually trying to break peoples infatuation with believing anything that comes out of a scientists mouth. Sometimes it is also used to explain pseudosciences. I really wish that it would have been socially appropriate to share this with her. Thank you for taking the time to write it! FACT: Scientists do not know everything, and that is a good thing. Keeps us learning and scientists employed. The real message of the story or myth is that there is a danger in over applying any thought, theory, or philosophy. Many people make science into a religion rather than a discipline. The story of bumblebees illustrated that the law of aerodynamics was (and perhaps still is) incomplete. People are warned against over applying this story in the same way we must be warned about over applying science. Science has demonstrated value and many who know this tend not to recognize the demonstrated valued in questioning science. It is in questioning and challenging that science is moved forward. Those who defend science too strongly perform a dis-service to science and validate the nut jobs who deny science. There is a healthy balance, a middle ground, that recognizes the value of things understood and not understood. Proven science is true until it is dis-proven. This has happens many times in post and modern science. Don’t be a science, religious, political, or any kind of fanatic. No, the story illustrates that people believe whatever they like and seldom do any fact-checking. Isn’t it amazing how many things science tries to explain. Many times it is to disprove God’s existence. So for decades people have discussed how bumblebees fly, the origin of the universe. Some things we are not meant to understand. I love when I hear that something considered fact by Science is disproved. For example: carbon dating, the smallest particle of matter and recently Einstein’s theory of relativity. If you believe in God you can be sure he occasionally says, “Ha, explain this!” We DUMB Christians love to laugh also. Leave the poor bumblebee alone, He doesn’t know he is causing so much consternation. Tell me how to get my left sock out of the dryer when it disappears or how to get the last bit of peanut butter out of the jar. That would be important and helpful. It’s impossible to prove God doesn’t exist, just like it’s impossible for anyone to prove that I am not an invisible unicorn. No scientific effort worth mentioning has been devoted to disproving God’s existence, since nobody can formulate a testable hypothesis. exactly. And just what are your sources for claiming that carbon dating, the smallest particle of matter and recently Einstein’s theory of relativity” have been disproven? Speaking to the gullible nature of humanity.. The laws of physics have been revised to correct errors in the past so if indeed there was a legitimate error that made it so insect flying was a violation of the laws of physics.. it would be important to the scientific community to learn what the error is and to correct it. Repeating it as a fact is not gullibility, it’s jumping on the bandwagon at worst., scientific method at best, with a LOT of grey area in between. Science has proven many times that what it once claimed to be proven true was never proven, or true. Hence, saying that “proven science is true until it is dis-proven” is an obvious over-the-top flight of fancy in itself, and clearly a statement made by a “nut job” who religiously worships science. Science does not discover “truths”. It builds models of nature and reality based on our current best evidence. So it is always rational and justified to accept scientific findings. Also scientific revolutions never throw away or replace previous “truths” with the new ones. New discoveries complement the old and usually widen the scope of their validity. Newton’s laws of motion will always be true even though Einstein’s relativity needs to be used at velocities approaching the speed of light where Newton’s won’t apply. As long as you continue to think why are bees able to fly, you’ll always be stumped. So look at a bee in the air and stop thinking it’s in flight. If it’s been a mystery for such a long time, then obviously it’s time to think out of the box. Bees don’t fly, they levitate. And only now since more focus on Hyper Atomic Resonance and Cavity Structural Effect that’s possible with Chitin will science realize why bees levitate. Ha! Well played, Chris Laing! This phrase is always used by people who are critical against science that has a personal agenda behind it all, and they do not only expose their ignorance while being at it. If you really want to engage in some intellectual honesty however, a better study of bees and natural selection should not be how they fly/hover but how the species ever lasted these past 100 million years (according to a 2006 Cornell study). You see, worker bees are the most important bees in the colony, but they are sterile and cant reproduce at all. Evolution should predict that mutation should be passed along to the next generation of workers, but as you know, only the queen bee has the babies. Only hundreds if not thousands of scientific research is in circulation to explain this not-so-minor issue. Bees are really not “simple” at all, they are fascinating and beyond complex. So is the rest of nature. Every cell of it. But in the final analysis it seems that just as I find it beyond humorous and astounding how anyone studying science can shy away from the overwhelming circumstantial evidence to suggest Creative Intelligence (as “circumstantial” as believing that a paved road was not accidentally created by way of an overturned cement truck, though you cant prove it), so too, those who insist the universe is all just one big mistake are likely finding my position just as humorous and preposterous. Apparently we humans are gifted with our strong convictions and we stick to them. Either God has chosen this to be our nature, or natural selection has found this to be crucial for our species. Whichever way you slice it, it’s here to stay. Thank God/evolution for that! Well, maybe we’re just at the tail end of out evolving the need for systematized, dogmatic religion and other irrational. Maybe we did need it. But the numbers are turning away from it, Jim. I know I’m perfectly happy to get my curiosity about the world satisfied without any religious trappings. And my daughters! Forget it. They are perfectly wonderful, utterly moral creatures, full of compassion, and no god needed. I’m a scientist. I teach critical thought and take wisdom wherever I find it. I find value and joy in compassion. No sublime Intelligence needed. Humans are not turning away from it, they are using the same stupidity to cling into new forms of dogma. Thank Jim. To me, it is ridiculous to believe that it alk happened by accident. Workers are unfertilized eggs. Mutations are passed down from the breeding bees, which generate the workers. Mutations that originate in the workers are not passed down. If it impacts colony survival, it’ll impact the queen’s survival, & thus be selected for or against. That wasn’t even a difficult question. That whole “everyone has their convictions” thing is a false equivalence designed to make people who lack evidence feel better. Even if someone points out you’re wrong (as I did), you can console yourself by saying it’s “just their opinion” & feel free to ignore them anyway. That you find the scientific answer “ridiculous” is what intelligent design propaganda set out to accomplish. Fundamentally, it relies on you accepting a short answer that gets you to stop thinking about the question. It’s easy to say “the really smart magic man made everything, & he’s the exception to the rule that complex things need to be created.” It’s much harder to actually explain the myriad of scientific laws that support a self-sustaining universe, particularly to people determined not to hear it. One extensive sentence of actual explanation – bees fly by rotating their wings, which creates pockets of low air pressure, which in turn create small eddies above the bee’s wing which lift it into the air and, thus, grant it the ability to fly.. Ten paragraphs of smart-arse jokes. it could be using laws that was not known to science today! It is a case of the scientists concerned thinking they were smarter than they really are and not applying any critical thinking. Rather than realising that there is something wrong with their flight model. Something missing or some yet to be discovered aerodynamic effect. They concluded that bees shouldn’t be able to fly or that they violate the laws of physics. It just shows their arrogance. The correct conclusion should’ve been. We don’t know how bees are able to fly based on our current models and need to study them further. I think Chris is right .Dragonfly wings have tubes in them. They are not for blood flow. Evidently they are for sound vibration. They Buzz. I would put forward that Bees ride on sound waves and create low pressure above themselves creating lift. Karl Smallwood wins the March.2018 Bravo-Sierra.Award, with “Swiss gas dynamicist.” ! I certainly enjoyed the banter between my esteemed searchers and would hope that I can add a possible connection to the “Coral Castle” in FL built by a man who apparently possessed special knowledge about moving large pieces of coral by himself by what means we can only guess but there may be a resonance between his knowledge and the design of the bumblebee. We do not fully understand how high frequencies interact with gravity. Observe the flight patterns of most animals with wings able to fly and you will see a distinct difference between how things like bees and humming birds fly compared to others which flap wings much slower. Bees and like creatures can change their directions in the blink of an eye, pulling many times the “g” forces conventional pilots can. We don’t truly understand everything. You didn’t even link an article, video, nothing disproving. I’m not saying your point isn’t valid, but it’s backed up with mockery of Asian scientists and not fact. Today I found out you can’t use “regards” this way. Two things. First, well done on catching the grammatical error. Things like that, from people claiming to be writers, make me grit my teeth. And second, nice TARDIS & Doctor pic, there! #4 is my favorite, #12 is my second favorite, and #10 s my third, but there’s plenty for everyone to choose from, LOL! Peace and Namaste and all that stuff.